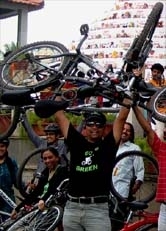 GoGreen Ride 2 bid farewell 2 B'lore's Historical Elgin Theater on 22 Jan 2012 - GGI-Group size: 4000+ Professionals, Increasing on day to day basis, Come & join us 2 serve Mother Nature. GoGreen team had decided to bid farewell 2 bangalore's one of the oldest Historical Theater by name Elgin in Shivajinagar. This theater was built in 1896, that means 110 yrs old and is now giving his way to new conventional Hall. 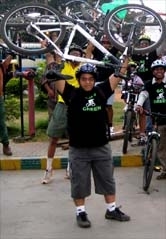 28 GGI's participated for this special ride. 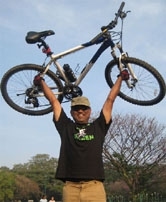 Starting from Cubbon Park @ 7:45am reached Elgin theater through MG Rd - Commercial Street, inside route of Shivajinagar's Market & finally landed up @ Elgin theater.